Before your interview, think about your responses to common questions, but put special emphasis on this one. 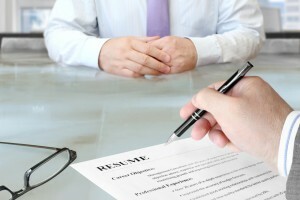 Because it’s typically at the beginning of the interview, you want to make sure you’re starting off on the right foot. Focus on your strengths as a candidate and what you bring to the table in relation to the opportunity. You don’t want to come across as robotic and scripted, so don’t over rehearse your response. It bears repeating, but make sure your response focuses on the opportunity, not just you. Yes, your interviewer wants you to tell him/her about your experience and interests, but they are hiring for a specific opportunity, so they need to see how you fit in. This is also a great time to show you’ve researched the company and learned the job inside-out. Always be honest and true to yourself at every point within your interview, but especially during the “Tell me about yourself” portion. Although it may seem easy, never fib or exaggerate, because hiring managers will discover your lie and your candidacy will be over. Remember, this is the first question you will be asked, not the only. Keep your response concise and don’t talk your interviewer’s ear off. Talking about yourself for too long will ultimately lead your interviewer to believe you’re self-centered – not a good impression you want to make! Sometimes the most common interview questions can be the trickiest. This is definitely the case for “Tell me about yourself,” but if you keep this advice in mind, you can be certain you’re starting your interview the right way with your answer. This entry was posted in Job Seekers and tagged common interview questions, how to respond to common interview questions, interview tips, Job Interview Advice, job search tips, tell me about yourself. Bookmark the permalink.